A function machine interactive whiteboard resource. Children seem to enjoy the concept of the numbers going through a process to be converted on a function machine. 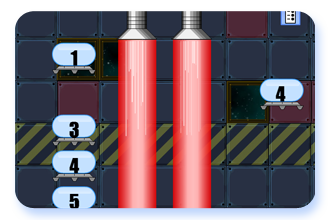 Borrowing a graphical style from computer games this function machine IWB resource lets you set one or two function machines. Click on the number and it will go through the function machine conversion process. If the number is on the left it will move right going through the process to become the output. If it is on the right the process will be reversed to go back to the input number. The single blue button brings up a control panel. From here you can determine the input numbers’ start value. The number of functions lets you toggle between one or two function machines. The hide details lets you disguise the the functions, input numbers and operations. Of course, this means that while you can hide all of this from your class you’ll have to count your clicks to know what you are entering. The numbers are also reset by opening and closing the panel. To enable the whole class to work along with the IWB resource there are a couple of printable resources in a similar style. On these the students can enter the start numbers and then the finish numbers after the process is complete and try to predict what the functions are. On a technical note the particle effects in this resource may be a strain for older computers especially on larger numbers which don’t really suit the resource but are possible as outputs. While the resource is new please check that any combination of numbers you wish to use in lesson work okay as there is quite a lot going on behind the scenes of this resource and it is impossible for all of the combinations of numbers and actions to be checked for bugs. If you notice any problems or graphical glitches please comment with problem, the numbers that the problem was caused by, an if you know it, your screen resolution. Other comments are welcome too. Single function machine printable resource. Double function machine printable resource. I would love to print this.. but it is not allowing me too! Sorry. I accidentally set the pdf files to unprintable. I have emailed the corrected ones to you and corrected the ones here on the site. Sorry for any problems this has caused anyone. Nobody mentioned it until now.